So, you have been granted Australian Residence and you are super excited to enter the next phase of your life in one of the most beautiful countries of the world. However, moving to a new country is not as smooth as it seems due to overwhelming formalities involved. Foreign skilled workers who apply for immigration to Australia often become clueless of the directions they should take after arriving in their new home. Therefore, it is necessary to keep oneself familiar with the procedures and other range of services offered to help them settle in various territories and states of Australia. 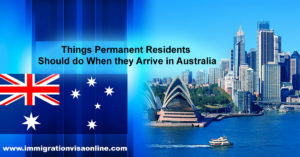 In this blog, I have compiled a list of necessary steps newcomers should follow when they arrive in Australia. Read it carefully and use it as a guide to settle comfortably in Australia. Residents who apply for Medicare in Australia get an access to free medical facilities in public hospitals or are entitled to receive medical treatments for free or at lower rates. As a PR holder, you must visit the nearest Medicare Service Center with your passport and other visa related documents for the process. If you meet the eligibility criteria, you’ll be provided with a temporary medical card number via post within three weeks. Residents need to provide every information related to their contact details such as home address and phone number to get the card without any interruption. In a nutshell, a Tax File Number (TFN) is a unique reference number issued by the Australian Taxation Office (ATO) that allows Australian Residents and other commercial organizations to file for tax returns and manage their taxes. The money collected through TFN is used by government organizations to fund government programs and support services such as construction of roads, education, healthcare, and many more. Residents or citizens of Australia who are employed in the country or earn through investments or business are entitled to apply for the TFN. Individuals, who have recently migrated to Australia are advised to visit the Australian Taxation Office and apply for the TFN before they start working in the country. The procedure can be done online or by going to the office. All you need is a Passport and an Australian address to complete the process. As part of the Department of Human Services, Centrelink is an agency that allows the Australian government to offer a range of social benefits and services to newly arrived residents and existing residents of the country. The department is responsible for developing service delivery policies and providing an access to healthcare, social, and other payments and welfare services. Anyone, who has an Australian PR visa or is new to the country can approach Centrelink and get assistance related to employment, skills recognition, courses and training, education, medicare, child support, youth allowances, and more. Depending on the type of visa you hold, there may be a waiting period before a resident starts receiving the payment. Once you arrive in Australia, it is very crucial to get your child or children enroll with a reputed school as early as possible. You may start contact the schools and get enrolment forms to admit your child. Parents need to show their visa and PR related documents and child’s immunization records. In Australia, special attention is given to the immunization in order to go to school. Also, it is important to showcase reports and certificates of previous schools attended by your child. Once you arrive in Australia, be prepare to contact a bank and open a savings account to ensure the security of your money. You can choose any bank depending upon your requirements and fee charged by them. Also, it is advisable to open the account within first two weeks of arrival in Australia as in that case bank might not ask you to provide additional documents other than ID proof, i.e., your passport. However, if you contact after a month or so, then bank might request you to show more identification proofs. Permanent Residents visa holders with a current driving license from another country are allowed to drive their own vehicle in various Australian states and territories only up to three months of their arrival. After that, they need to apply for a driver’s license to continue driving across the country. Individuals, who hold a license issued by their home country need to pass a theoretical test. However, those who do not have a license prior to coming to Australia, need to qualify for the theoretical test, a practical driving test, and an eyesight test. The initial days are the busiest days in Australia as there are so many things to be done and formalities to be fulfilled. But, with the information mentioned above, you can kick-start the new phase of life with peace and comfort. Previous Post: Australia E Visa Application–How to Select the Best Immigration Consultant?